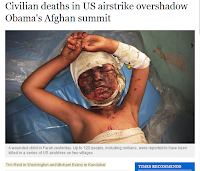 That's a child harmed by an American airstrike in Afghanistan. It's not clear whether this was an unmanned Predator drone that strafed the boy's village. Congratulations to President Obama on the Nobel Peace Prize. Hopefully, the honor will inspire him to embark on a rational strategy that seeks to de-emphasize the "perpetual war state" policy that currently defines our country's foreign affairs. Korea, Vietnam, the proxy wars of Central America in the 80's, Desert Storm, Iraq, and now the interminable 8 year-long Afghanistan misadventure. Isn't it time we lay down our guns for a few years and start to address the serious problems within our borders (health care, post-industrial employment, economic collapse) that threaten us exponentially more than a bunch of Islamic sheep herders and opium lords half way around the world? Just a thought. You're heart is always in the right place. You're morals and ethics are clear. If only the world could follow. Yes. I too Congratulate the President (out of respect). However, please note that our involvement in Afghanistan and Iraq can be viewed on a long-term vision of appropriate investment in our world's future. This is a challenging concept to discuss in any short forum as our politicians tend to make many mistakes that muddy the vision. I do want your readers to know that our military spends about most of its medical mission on the indigenous peoples. This is in stark contrast to that of any other foreign nation. Additionally, General McChrystal had ordered the immediate cessation of any indirect fire into potential civilian locations to limit the horrors that you have truthfully shown. I will hope to report to you more on this topic, as I am due to deploy to Afghanistan this January. Good luck and safe travels. Stay out of harm's way. From your lips to somebody's ears. I am so tired of us sticking our nose in others battles. Yes, I know we need to defend ourselves, but so often, it really isn't about us. Sarcasm works like a charm. MQ1 Predator drone does NOT strafe. War is inevitably brutal and ugly; that's why it's called a war. The war - oh, i mean WARS - belong to Bush Jr, not Obama. BTW, since when is Obama responsible for any and every fart that Americans make across the globe? Let's first get the facts straight, shall we? If we cannot resist the temptation of generalization & dramatization, what makes us that much different from those "Death Penal" idiots? Just a thought. I am taking this opportunity to say I have no respect for those who hide behind the safety vail of the anonymyzing Internet. If you have an opinion then have the courage to stand behind it openly. Otherwise your comments mean squat. At least Buckeye stands behind his beliefs. He is also firm and decidedly unashamed of his convictions. If you read his blog you will find out that he never changes his opinion because he has thought through why he believes whatever it is that he writes about. I do not agree with his some of his particular views. But I respect him and I respect his moral stand. In this case, I disagree with him because I think we should be in this war. I think that we are in a fight for our lives. The leaders of these countries and radical muslim movements are overtly evil and quite frankly insane. Simply laying down our arms and putting our head in the sand hoping that the bad man goes away is not the answer I can accept. Please note that Buckeye and I can have a civil conversation without name the calling and disrespect that so many people use these days as weapons/crutches to shout over the other opposing view. Also, adding snide remarks about technical aspects such as that a Predator drone does not strafe is simply unprofessional. In a debate you stick to the focus of the argument. Diverting the topic is an obvious attempt to sound smarter than your opponent. This won't even come close to phasing Buckeye. Obama inherits the wars and the economic mass; he does not own them. Analogy: When a patient is admitted to your service, the patient ultimately owns and is responsible for his/her own health while we are responsible for his/her medical care during admission. Pulling out of either war (far too easy to say than done) too soon & committing too much into the asymmetrical warfare BOTH have dire consequences. I am glad that he consults both military and political advisors before making each critical decision. Few people are optimistic about the near-term outcome of the wars but informed decision is still a hallmark of good leadership. GOP's latest mockery makes us look fabulously and globally ridiculous. I happen to agree with Buckeye on this one. We, the US - and we ALL are responsible for what our leaders do on our behalf - have a problem minding our own business. We feel a responsibility to "spread freedom" which all too often means to involve ourselves in the affairs of other nations in ways which ultimately harm those we ostensibly would help make free. We have killed hundreds of thousands of people in the middle east over the last 20 years. We were killing civilians in Iraq under the Clinton administration with extremely poorly thought-out sanctions - the ones Madeline Albright publicly acknowledged killed thousands and that were "worth it" if they would help depose Saddam. We actively killed hundreds of thousands more as we launched the war in Iraq - for no good reason and in violation of all international standards of legality and decency. Now we are killing in Afghanistan - a spectacularly backward country which itself poses absolutely no threat to us, except as a former training ground for fanatics who are motivated by their religion and by their disgust at our actions on the international stage - which anyone with a shred of decency should completely understand. My wife and I lost a very close friend in the Trade Center on 9/11. I appreciate the sense of loss and sense of threat which many of us feel. But I suspect it is similar to the sense of loss felt by the families of those equally human victims of our actions in Iraq, Afghanistan, and other places where we have acted out our game of "king of the mountain" for far too long. Each bomb we drop, each village which gets hit by a drone, even each man, woman, or child shot going through a checkpoint or as a collateral casualty in a small skirmish - each of these makes more people who hate us. We can't win this with the military, and it is long past time we stopped trying. I wish all the best to Dr. Sucher and his colleagues during his deployment. Our military medical corps serve with honor and grace. They represent the better angels of our nature. I wish our political leaders did the same. Moral, political and economical erosion [in the US] - no need to look further than our own border. Here is just a brief list of things that mainstream American constituents & policymakers oppose: family value, education, scientific/rational thinking, universal health care, healthy lifestyle, vaccination, [financial] regulatory reforms, tort reform, social/racial equality and firearm control. There are three pillars that determine the future of a nation: education, healthcare and economy. Lose them, lose all - with or without the wars, with or without Obama. Though IMO Iraq was a fiasco that did not have to happen in the first place. We are stuck there. You can't undo the past. Though you can appropriately critique W on this sad episode in American history. The historians will do that. i would say that Obama understands the cost of war and peace more acutely than many of us dare to give him credit for. note: he wrote the [second] speech himself.